Add the flour, the salt, nutmeg and cheese in a bowl. Mix with eggs until the texture is similar to a play dough. It cant be to stick, neither to dry. Add more flour or a little bit of warm water if necessary. Let dough to rest for about 15min wrapped in plastic or inside a container. How to form the Garganelli? 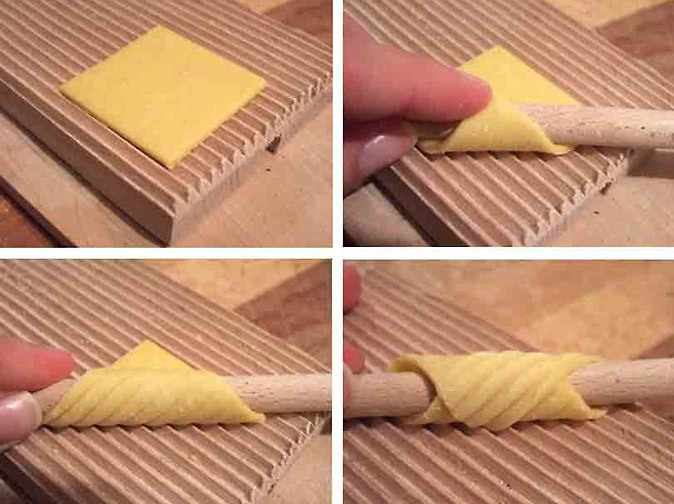 to the bottom of the diamond.At the end, press down to seal the bottom point of dough to the roll.Slide the formed quill off the dowel onto a floured tray. Continue until all the garganelli are formed. Set the garganelli aside to dry for 2-3 hours.